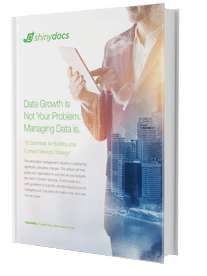 At Shinydocs we want to change how you manage your information, not how you work. We’ve done a lot of thinking on how to drive long-term success across the enterprise and have captured some of thoughts in the following ebooks. Don’t change the way people work. Automated processes are faster, more accurate, and reliable. Get competitive and change the way your approach digital transformation. 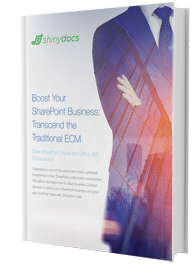 Strengthen and expand your data management offerings by providing customers with the tools they need to intelligently manage content on premises and in the cloud with zero change management. The information management industry is undergoing significant, disruptive changes. Find out how drive organizational success and navigate the road to Content Services.